Tsai Ming-liang won the Grand Jury Prize in Venice and Golden Horse Awards’ Best Director for Stray Dogs in which Lee Kang-sheng won the Best Actor Award at the Golden Horse. In 2014, Tsai’s Xi You/Journey to the West was nominated for the Panorama Section at the Berlin International Film Festival. In 2005, his The Wayward Cloud got selected in the Berlinale Competition. Lee Kang-sheng has already walked in Taipei, Hong Kong and Malaysia in Tsai’s Walker franchise. 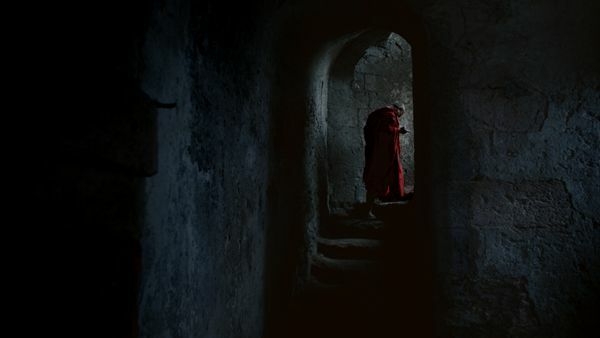 As for Xi You/Journey to the West, Tsai Ming-liang found French actor Denis Lavant to walk in Marseilles with Lee. Xu Jia: Were you joking when you said that Stray Dogs would be your last feature? Tsai Ming-liang: No, I was serious. I was thinking about that, but it might not be so absolute. I leave things to fate, although I don’t feel like making films all the time. Sometimes, I can be persistent, but things could happen out of my expectation, like Stray Dogs. The production company came to me, and then I thought I would regret if I don’t make it. I love making films, but I get tired of many things, including film promotion and shooting. It’s exhausting. I never feel that I have to make as many films or I must keep making films. It’s not necessary. There are lots of thing in our life other than films, and that’s why I seldom talk about films with others. People asked me what I need to make a film. I named three: money, freedom and Lee Kang-sheng. It sounds a bit contradictory; however, when you give me money, you must give me freedom. I will do my best when I have your trust. So when we cooperate, my investors knew exactly what I was doing; thus, they let me fully concentrate on my films as they knew that I am responsible. Xu: As for your Walker franchise, it was mainly exhibited in art galleries or exhibition centers. Does that mean the audience might need to go to those places to see the films? Tsai: I don’t feel the Walker franchise is for a small group of people. You see things in a simplified way. People usually go to theaters to watch films; if nobody watches it, then that is it. However, there are always people in art galleries. The process might be slow, but it is a process of accumulation. People in China were watching my films via DVDs, although I got no profit at all. Even you are not happy with that, you can do anything about it. Nevertheless, they get to know you and gradually come to like you through DVDs. By the same means, I get to know and like some directors. Theaters, especially those cinema chains, are like markets. So there are concepts and contents are made for this market. This situation has been changing as the audience is changing. Theater plays may be agreeable to past audience, but a bit hard to digest for contemporary audience. As a result, it cultivated audience with lower tastes. Why there were French New Wave and New German Cinema in Europe? Even for Japan, a country westernized much earlier than other Asian countries, the audience could accept all kinds of possibilities in the postwar era with appreciation. However, other Asian audiences have been cultivated by commercial cinema chains; eventually they can live without films. Most people never go to theaters after they get married as they just watch DVDs. They just watch so-called box office hits, and they have never changed. Different people on the planet have different understandings about films, and it is just about how you will cultivate your audience. You can go to art galleries, even children can go. This would work in Europe. You also can find art house theaters or other channels to get your film released, and it can be easy in Europe. On the other hand, in Asia, few would care when you are about to build an art house theater. Films do not have to rely on film festivals. When Stray Dogs was screened in film festivals, there would be a potential world distributor. However, I don’t want Walker to be in film festivals unless we are invited. I don’t think my short films can get any support from film festivals, and they would just be screened along with other short films. However, if my short films are exhibited in art galleries, the screening could last for three months or even half a year, much longer than at film festivals. So how can you say that the audience will not go for it? I am cultivating my audience in Taiwan. There are many universities in Taiwan, and some scholars take my films as case studies. I am not sure about the influence of my films, but it is a way to cultivate our audience of different tastes. When I am selling tickets, I am actually selling space and time. I negotiated with theater owners that I have ten thousand audiences, and you can give me two weeks. If I don’t sell those tickets, my film won’t get two weeks. This is how I cultivate my audience. Sometimes, I feel tired and I deny myself. I am doing this on my own, and people are laughing at me or think that I am annoying. One day, a friend told me that someone was criticizing me, saying: “How come this bald director represents Taiwan? Is it not miserable enough that he has been harming Taiwanese films for over a decade?” I guess he might not be very young as young people generally don’t recognize me. Then someone wrote a reply: “Tsai Ming-liang is making art house films, and that’s his creation. If other directors don’t make commercial films, that is not his problem.” I feel that there is still a positive voice. I have been doing this for a long time, making my own films. I always act audaciously to the Golden Horse Awards. I quit the competition twice. I just have my own thinking, and they knew it. They also told me there were many changes in the Golden Horse Awards because of me, and I was told so after that actually happened. It is not Golden Horse Awards’ problem; it is the problem of the whole society. There is nothing wrong with a film festival. It is the society that is getting worse. If you want to make a difference, you should change the society instead of the Golden Horse. How could you make good films that hardly find their audience? How could you expect the audience to grow when you serve them bad films? It is a circulation with all kinds of correlations. If the society is not open and tolerate enough, how you can dream of liberate creation? Taiwan actually has become open, but there are still biased people. I think it is quite normal and I did not really care about this at that time. There must be controversy. It takes time for my films to be understood by the public only if you can stand up for yourself as long as possible. I am lucky, and that is why I am still here. About 4 million mainland netizens criticized Walker. What were they thinking? They are educated. How could they act like this? They would not post such comments if they are illiterate. Their comments were rude, but I never retorted upon them as I was watching. I thought to myself that this finally occurred. There must be a film to reflect the phenomenon, otherwise it’s just illusions. They wrote both positive and negative comments, but when they watched something that they have never watched before, something slow or something with a different tempo, they became so silly that they would curse you. When I was watching Bergman films or Antonioni, I would not dare to curse but hold in awe and veneration even the film was quite obscure. However, people nowadays act as if they know everything, but they actually know nothing and they are ignorant. There is no need to argue with these people. I believe they would change one day provided that we had great films that can influence them. Xu: Do you still watch films? Tsai: Yes. I often watch silent films, and I introduce them to my friends. Recently, I screen films like Nanook of the North or some Cantonese opera in my café. People have never watched it before, and they think it great or the script brilliant. Films have their mysterious world. I mean, after a hundred years, we will no longer exist in the world but Lee Kang-sheng will still be here: the images of yesterday will remain if we keep them well. However, I believe that everything can wear people’s volition. Films are not exception. I have read a theory about the death of film. Film is disappearing, fading and damaged. Restoration could not save it. In every age, there will be new artists or new creators who would do what they should do. I always observe dogs as I have dogs. I also watch other animals and then realize that humans are the most evil and unkind species that are dominating the world and act as if they are the superior. When you look at the world from Lao-Tse’s perspective, you will find yourself nothing but a stray dog. Therefore, most of the time, people should expand their outlook, and understand that how small they are. Many films are the same: American comedies, action films, Sci-fi films and Hong Kong or Mainland films, don’t you think? Rather mechanic performances. The audience is just looking for the best or the most touching ones among them. Being a director, I would rather do something different. I never think myself as a dominator but a bystander, as I cannot control everything as if I were God. Therefore, I prefer to recover one’s original simplicity, keeping a scene as it is. The only thing that can change it is TIME. We don’t need to make any changes to it as we will never be as powerful as time can be. The remains change with time. So are old people. I am making films as a bystander; so I let things be what they should be. Just let it go. P.S. This interview was made during the 70th Venice Film Festival.